The Chess Player's Chronicle of Apr. 1856 (p.127) attributes this match to the year 1849, but the match was announced to have started in the 25 Dec. 1847 issue (p.410) and the final result was given in the Apr. 1848 issue (pp.113, 125). 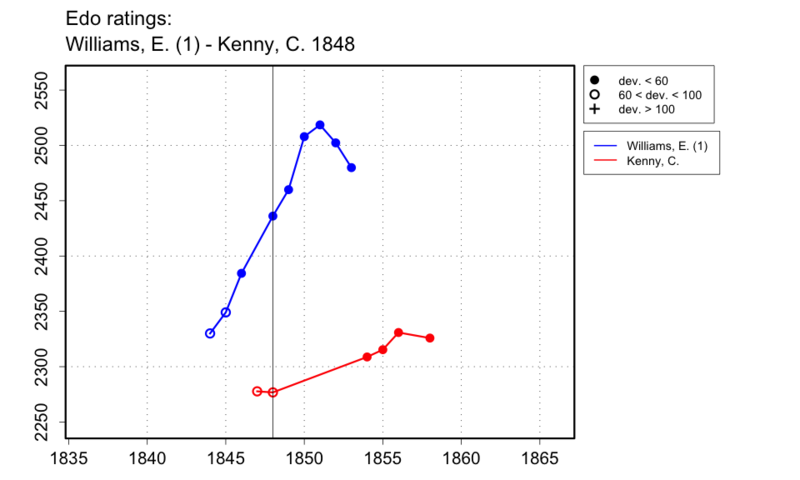 Spinrad, aside from giving the year 1849, gives the name of Williams' opponent as 'William S. Kenny', but the Chess Player's Chronicle of 1847 and 1848 makes it clear that it was Charles Kenny. The Chess Player's Chronicle of Apr. 1848 also says that the match had just finished, so I will guess that it ended in Mar. 1848.